The seedlings from last year have done really well. They put out buds and have many small branches already. To match what I did to the trunks, I thought only appropriate for the branches. 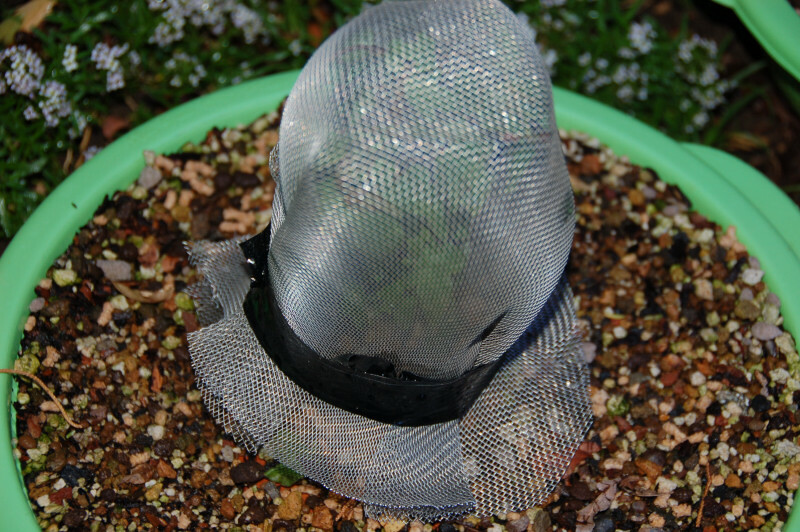 I made some small screen cages to train the branches under much like I did with the seedlings. 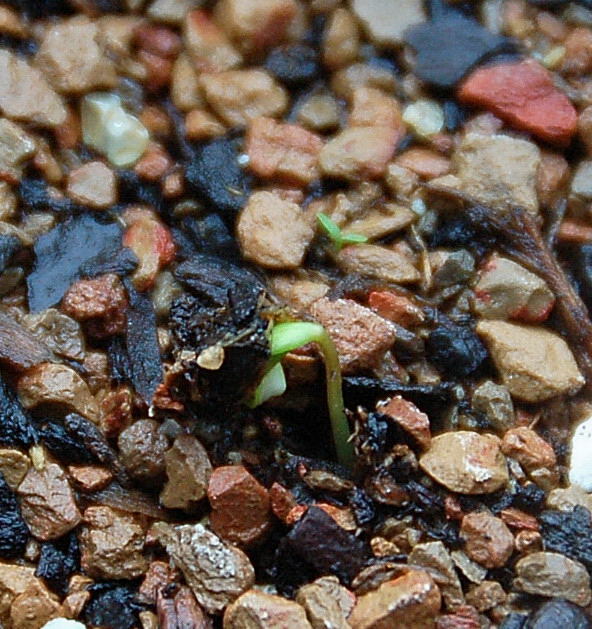 This is one of the seedlings. The trunk is already at the edge of the hole drilled into the tera cotta plate. It will begin layering itself very soon. Probably about 60 days it will have roots on top of the plate. 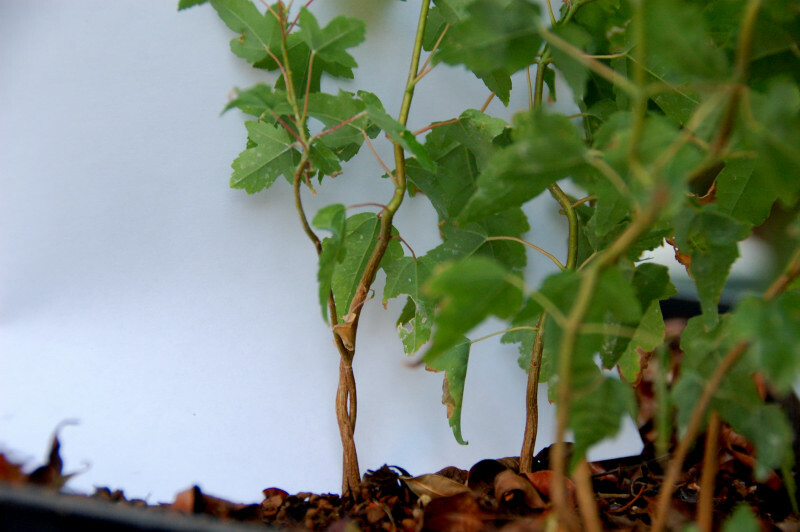 There are small branches at each node on the trunk and now is the time to begin their training. 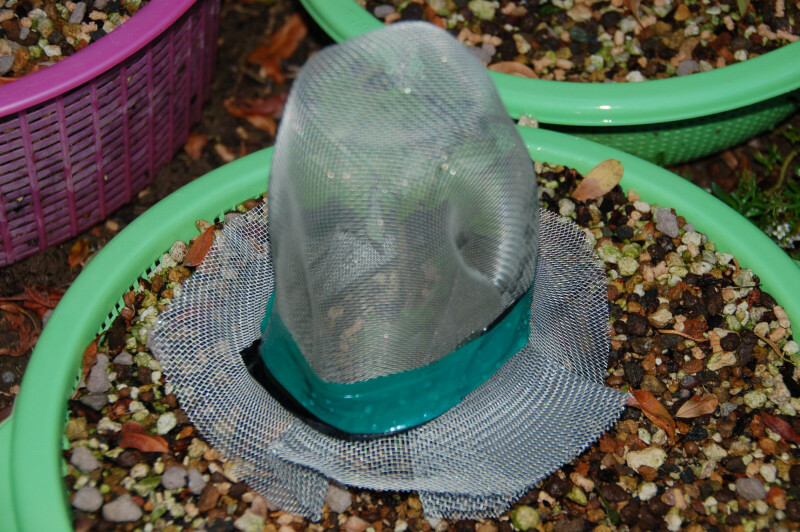 This is the screen cage I made for the seedlings. The branches will just swirl around in this confined cage and make all sorts of twists and turns. Time will tell if I am successful. I made three in all. 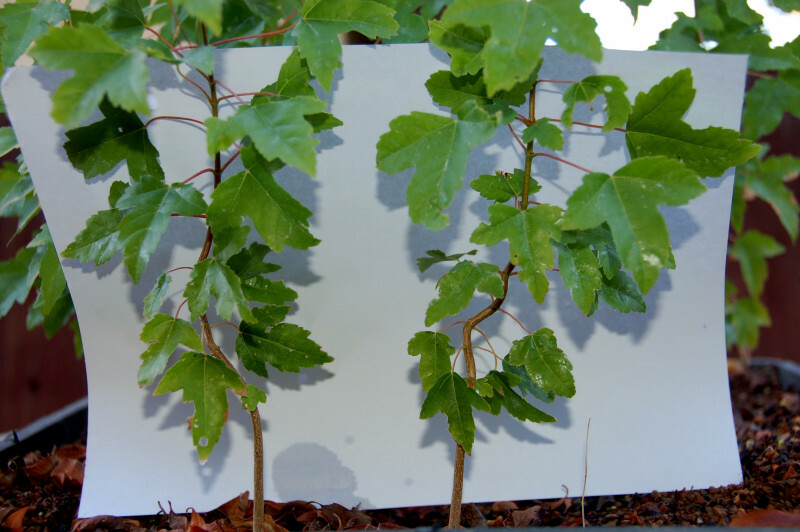 The other maples are in groups of three planted thru a tile also. Those will be trained with more traditional methods. Well Sunday after the swapmeet I was able to get my seeds in for this year. 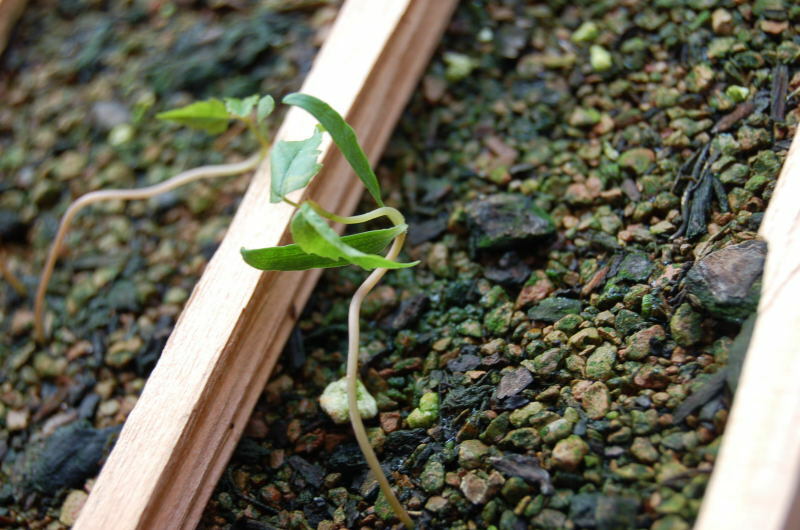 I bought seed from a different company and hopefully the germination rate will be better. I planted 400 seeds this time, and I plant on making more of the tridents under screen this time. 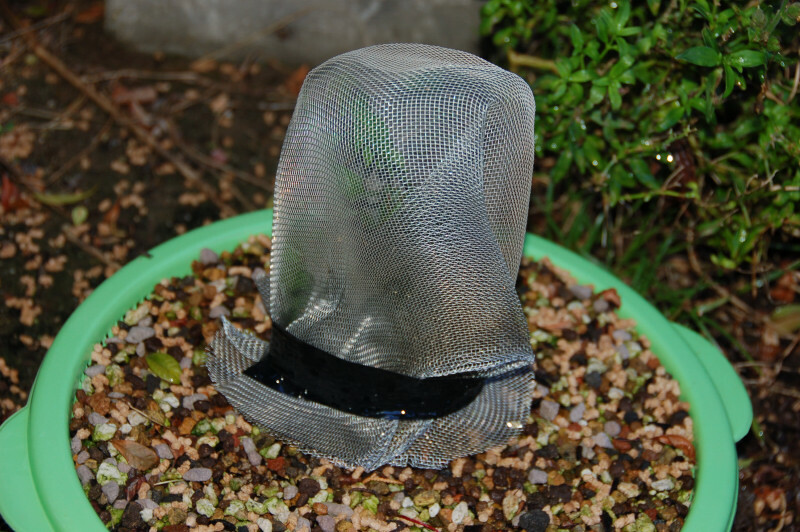 This year I have a new idea which I will share when ready and plan on keeping the seedlings confined much longer than this year. Recently on a discussion forum post I saw some trident all twisted up on growing cascade style from a stone. I will try to introduce a yamadori style method to these tridents and see what I get. 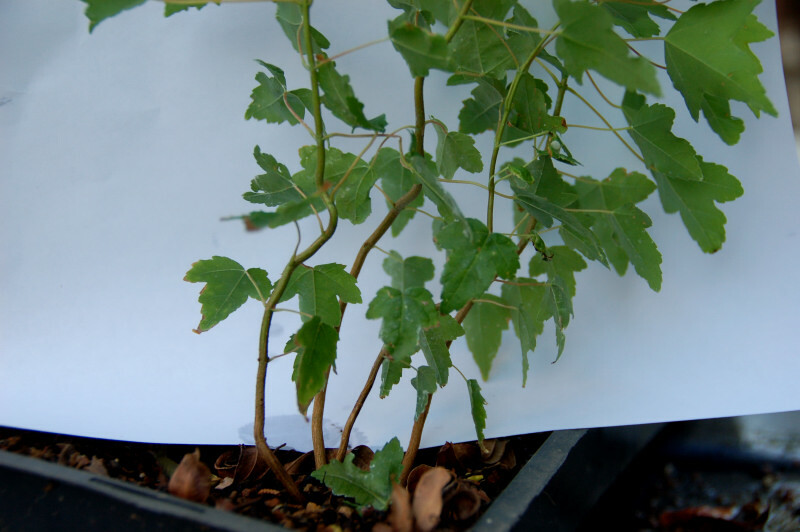 Many of these will also be grown in a clump so that they intertwine and graft together to make a larger trunk sooner. This year rather than grow these in turface and sand I decided to grow these in Black Gold brand cactus soil. It is a blend of pine bark and pumice about 50/50. 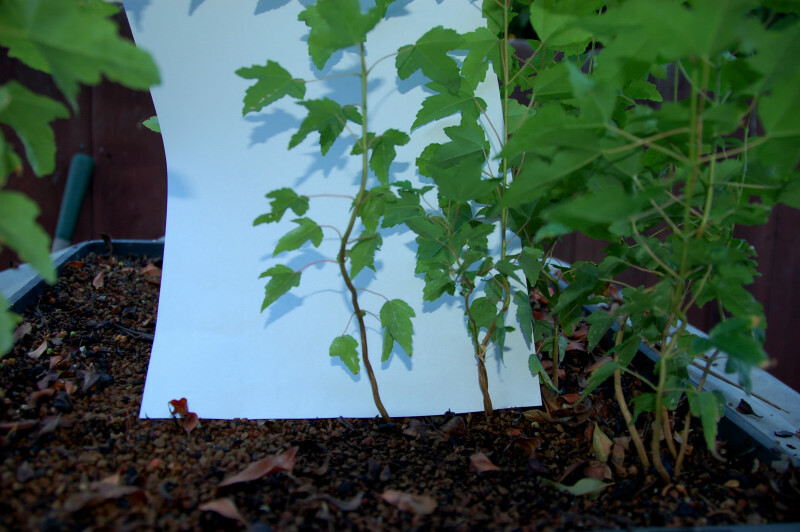 The bark is pretty coarse and I am sure it would work as bonsai soil also. Pretty easy to get at any home depot. It should be an interesting year all around. 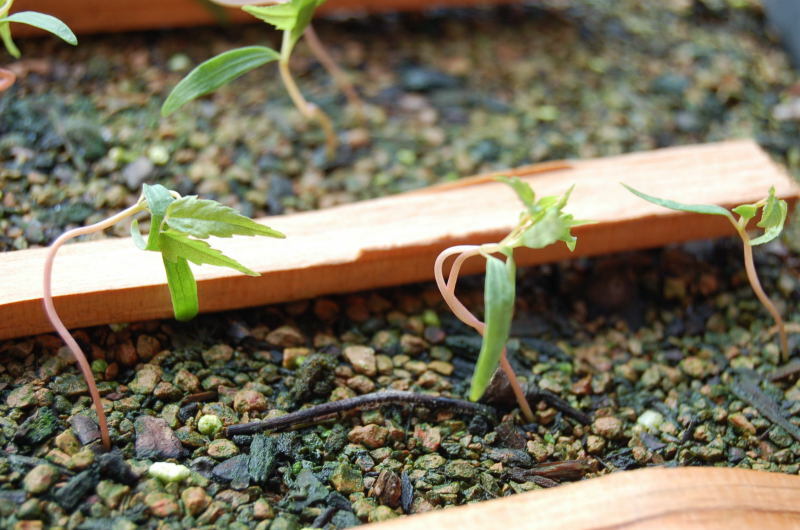 During the last six months I have shared my seedlings from the beginning. 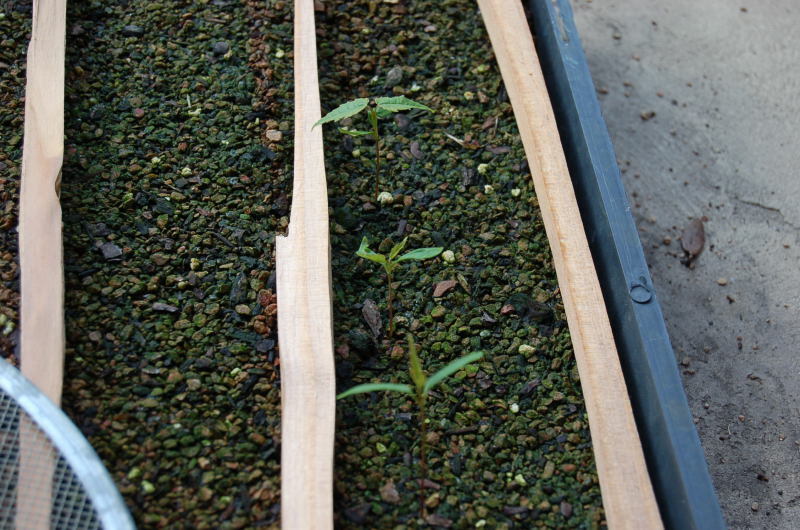 They were planted out on Jan. 3rd and sprouted 30 days later. 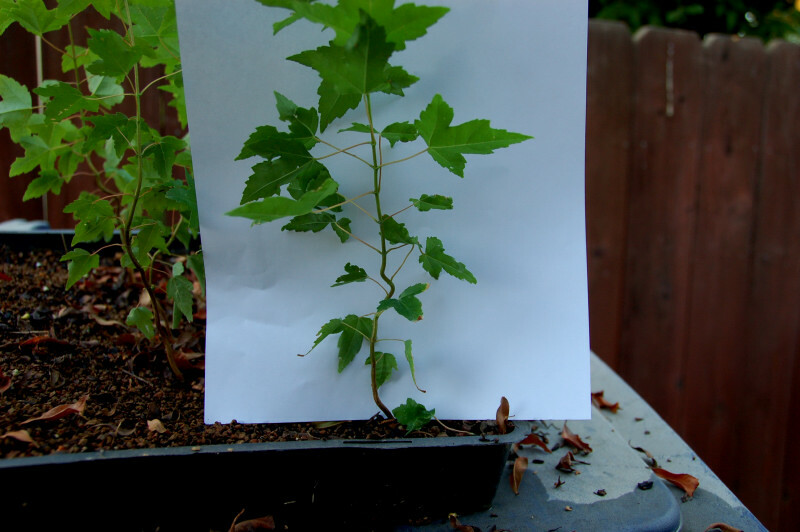 I shared my technique for growing them under window screen to gain some movement in what would become otherwise broomstick trunks. After two months I was able to elevate my screen on a couple 2 x 4’s because of the quick growth. 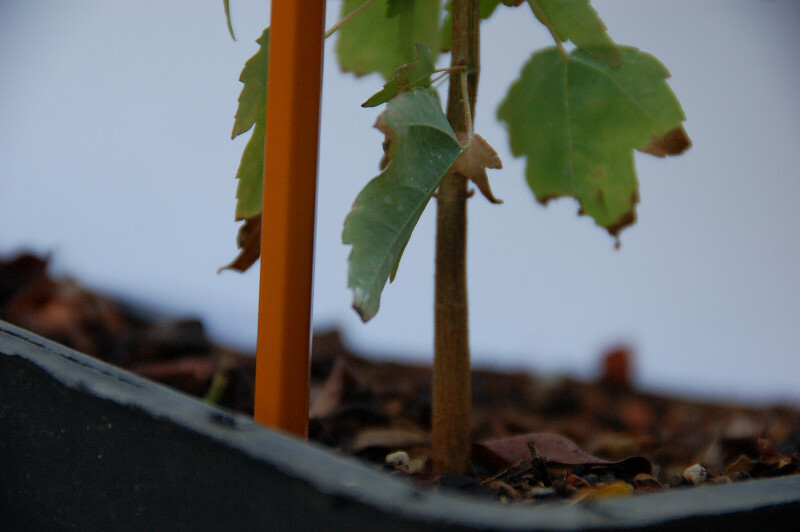 Now six months later I can once again update this saga with the newest pics of the small trees. The trees are now about 18 inches tall. One thing I can share that is interesting is that the one and only that did not grow under the screen is almost a third taller than those I stunted under the screen. 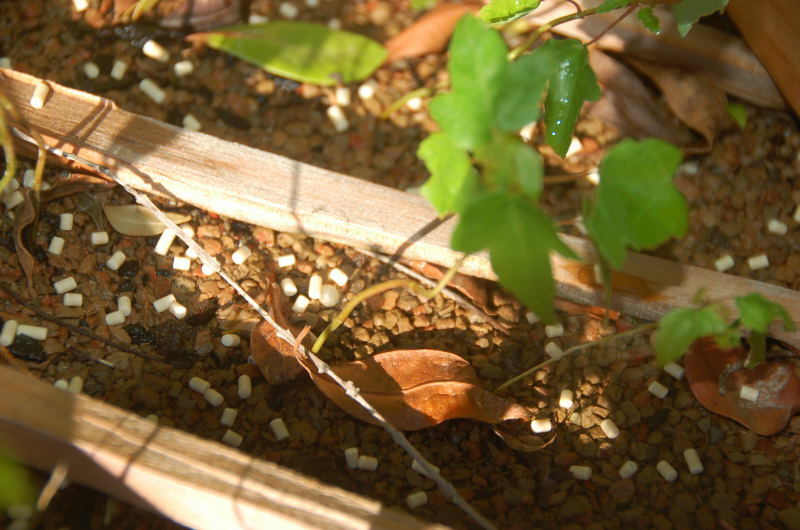 It can be seen the far left in this photo of the whole seed bed. For some unknown reason I got good growth in the opposite corner and was able to cover them easily with a screen from my sifter. The lone tree just grew like a broom stick. Here is a picture of the tree all by itself straight as an arrow. BORING! Now lets take a look at some better trunks and what these may bring to the table in a few years! Here is the lone wolf shown with a pencil along side for size comparison. 6 months and mine are nearly double what I see sold on the net. Can’t wait to see what they look like in the fall. 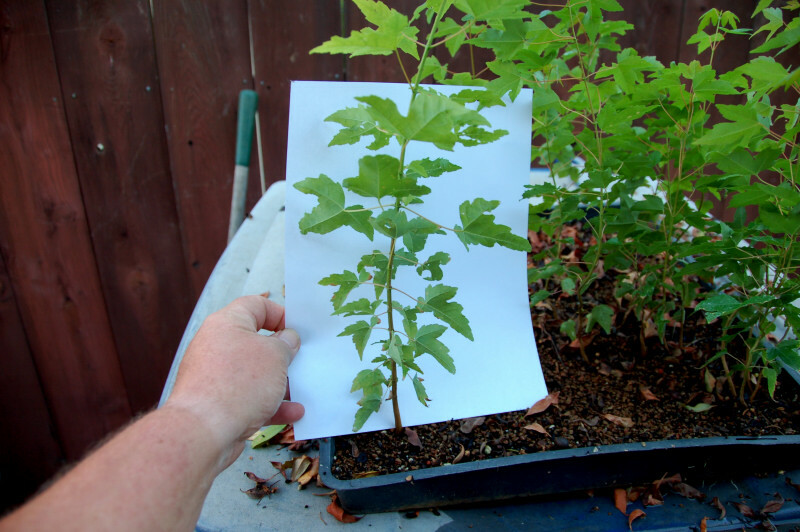 I will select the best few for growing out in the ground and the rest will be used for grafting roots onto larger trees. I will do a better job this year in preparing the seed as well as planting about 500 this year for grow out and possibly for sale later. This is how the small trees are doing now. 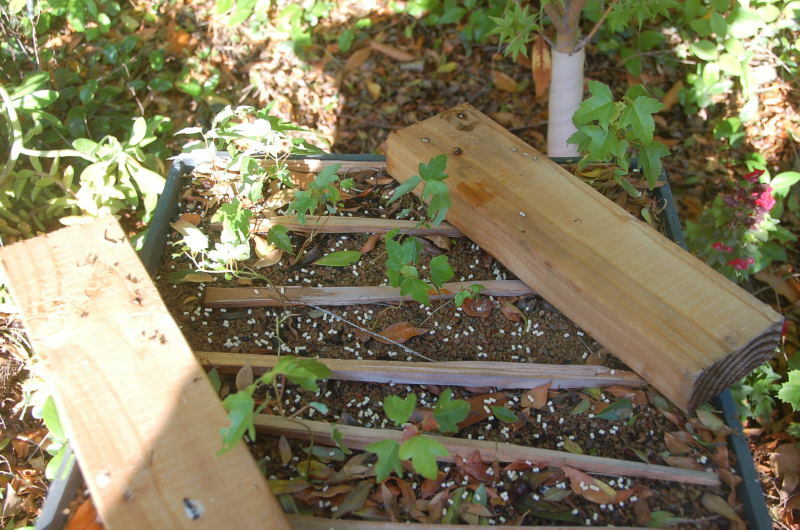 The screen has been elevated on some blocks of wood to keep the seedlings crumpled and adding interesting shapes to the trunks. In total about 27 sprouted. 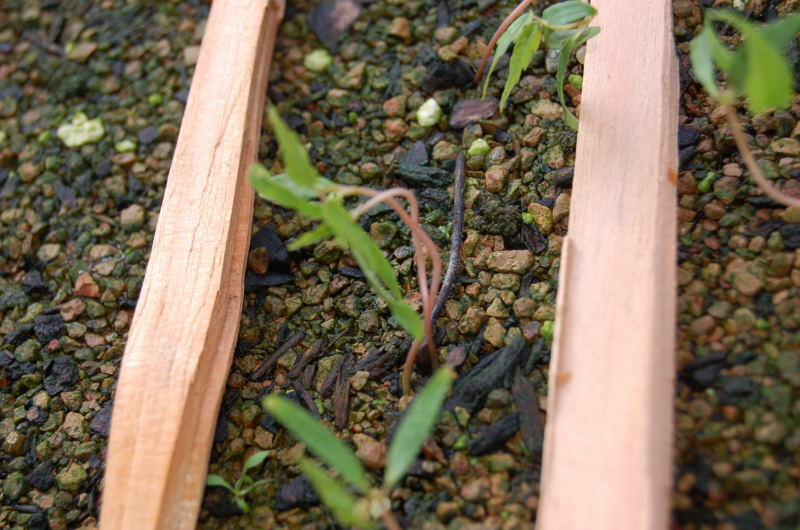 snails have got about 7, leaving me about twenty seedlings. Not a very good yeild out of 100 seeds. Maybe some will sprout next year. 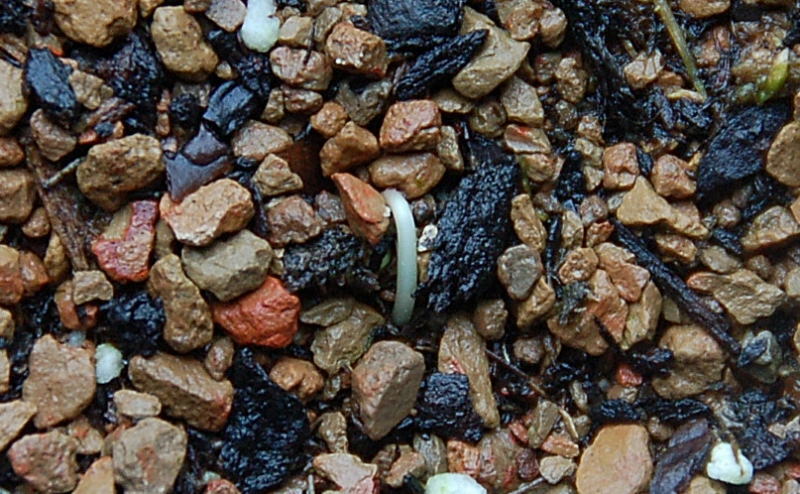 I have been told that sometimes they take two years to germinate. I continually battle snails and slugs that eat every leaf off the stems. 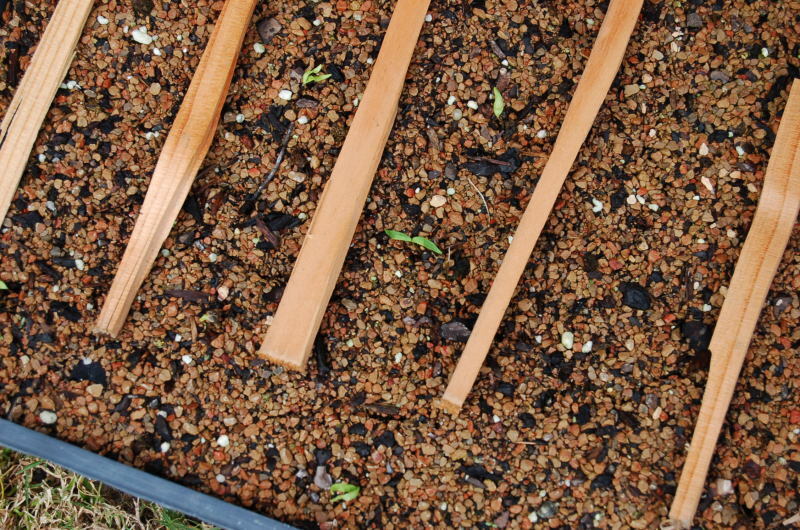 When I left off in the seed bed, I talked of growing some seeds under window screen. 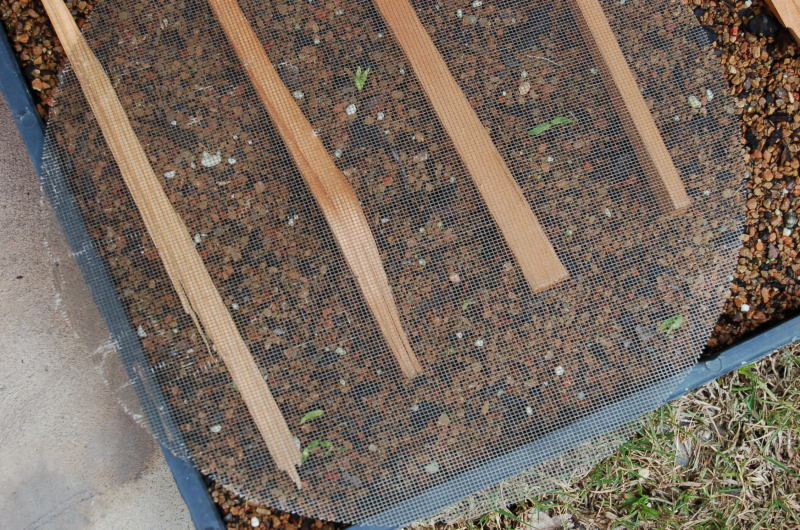 Over the many years on the forums whenever a seed thread would come up I would suggest growing some under window screen. I never in all those years ever seen anyone take the advice and try it. So…. 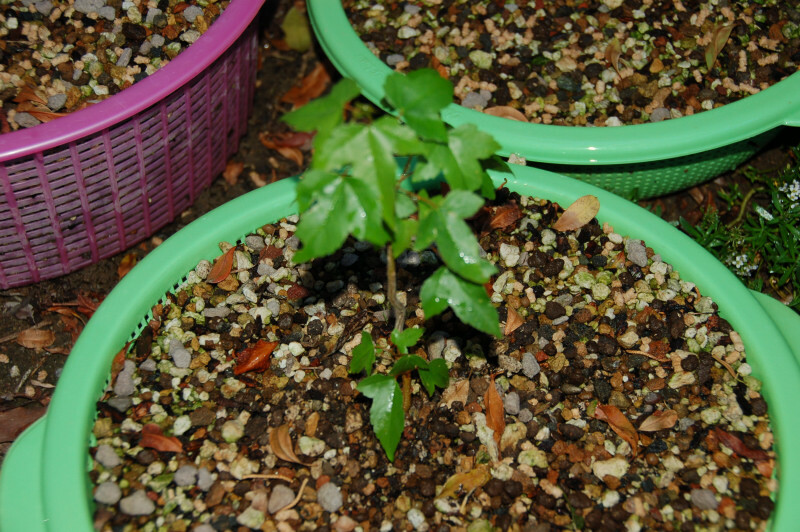 since I have decided to go the seed route again 30 year later in my bonsai career I will share what I did. 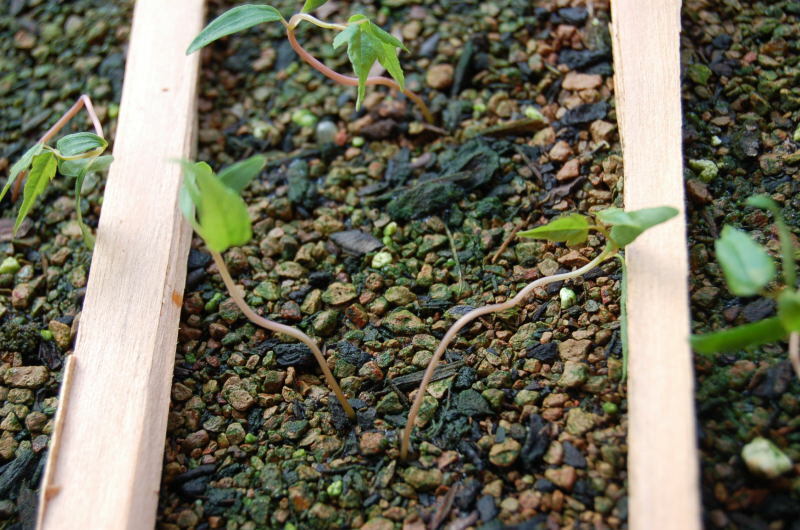 This is what the seedlings look like when grown without the screen. 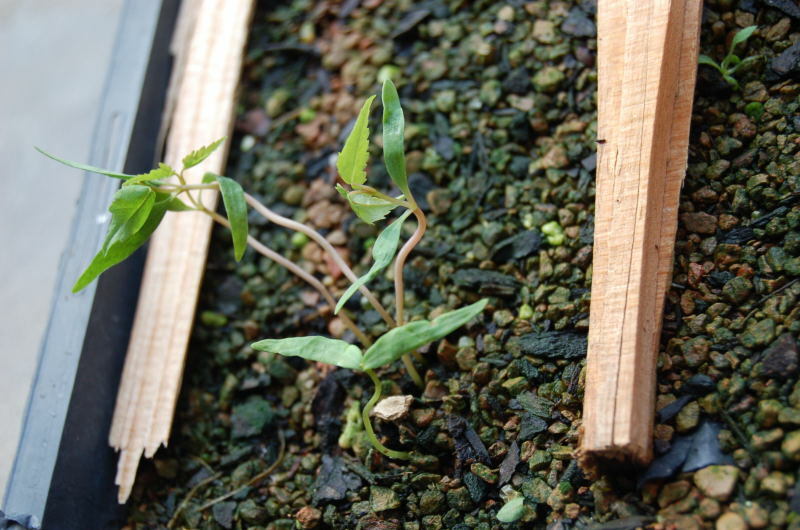 This is what the seedlings look like grown under the screen. 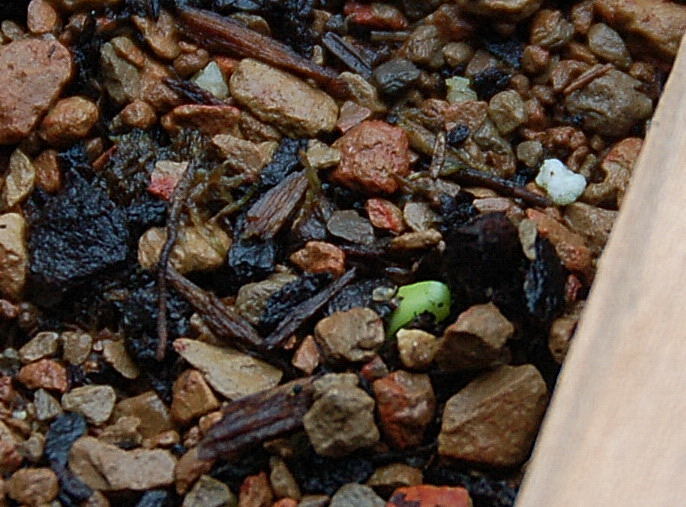 I turn the whole seed bed every other day in order to get the little critters to move towrds the sun and in turn get more movement into the small trunks. 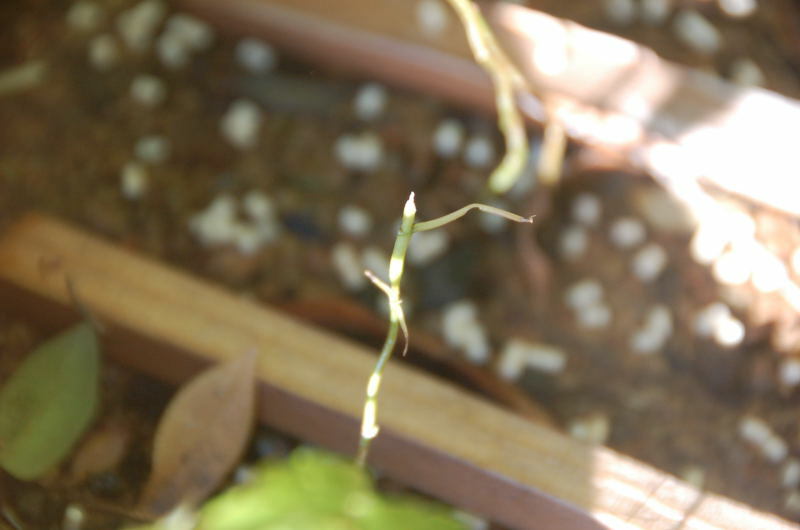 Those seeds I planted in clumps have even twisted together in some cases. 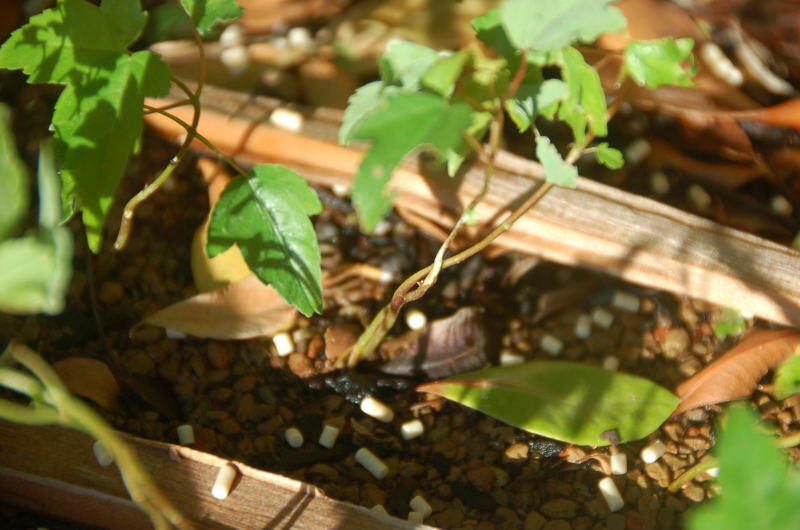 In any case, I feel that the increased movement within the trunks will give me better material to play with sooner The main thing is to get that lower trunk leaving the earth at a good natural angle, that is what is most needed in any tree for bonsai. They are going to get even better as I get more sun here. This week has been better in the low seventies but this weekend we are to maybe break a record or two and when the sun comes up for longer periods in the higher temps I expect to get even stronger growth. 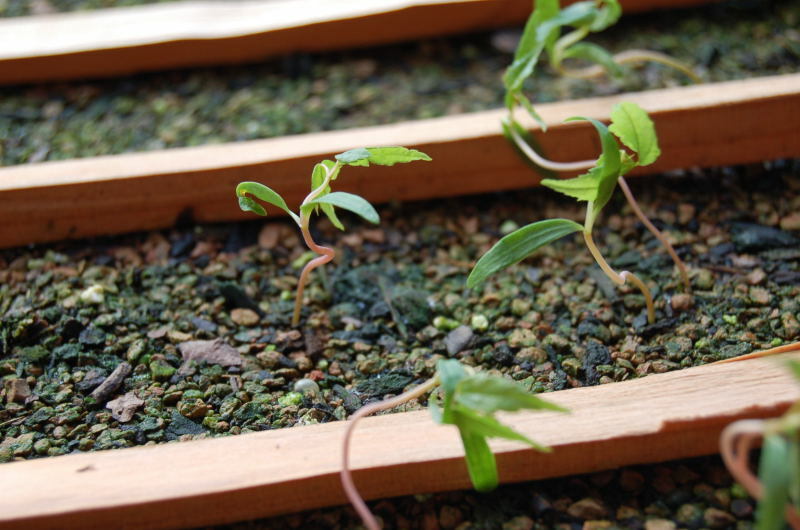 This is just a taste of what these seedlings can do. The seeds are doing fine so I thought I would show some more of my ace in the hole. 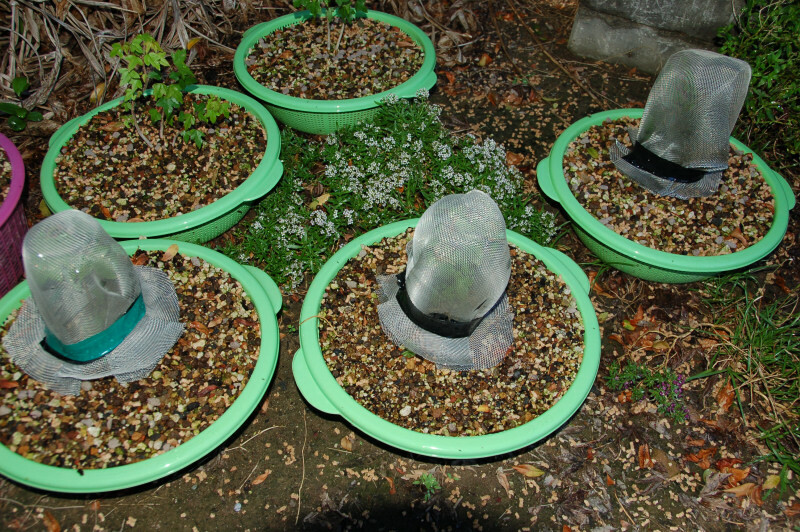 Many years ago I started some pine seeds and used this trick. Many came up and worked but I lost all of them due to fungus, dampoff, birds and critters. 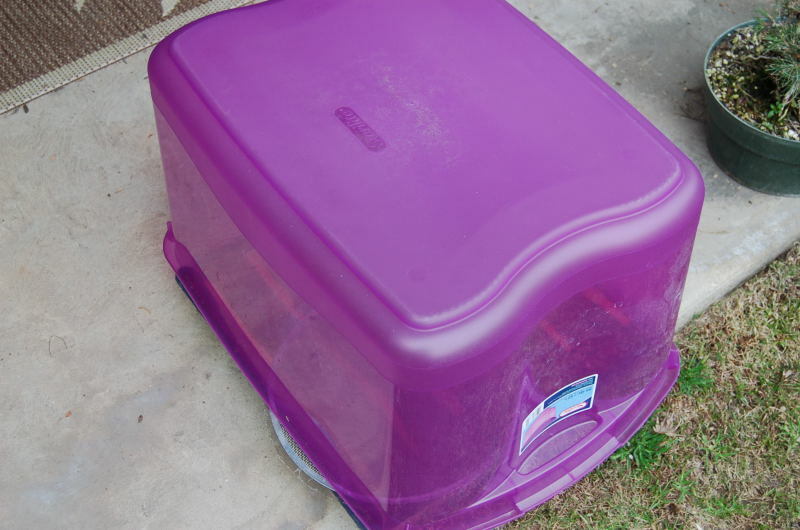 First, since they are coming up now and I have critters and birds and stuff not to mention it is still cold at night, this sterlite bin turned upside down works great for a mini green house. Fits right over the pony pac flat I planted the seeds in. Keep in mind there are a hundred seeds in there. 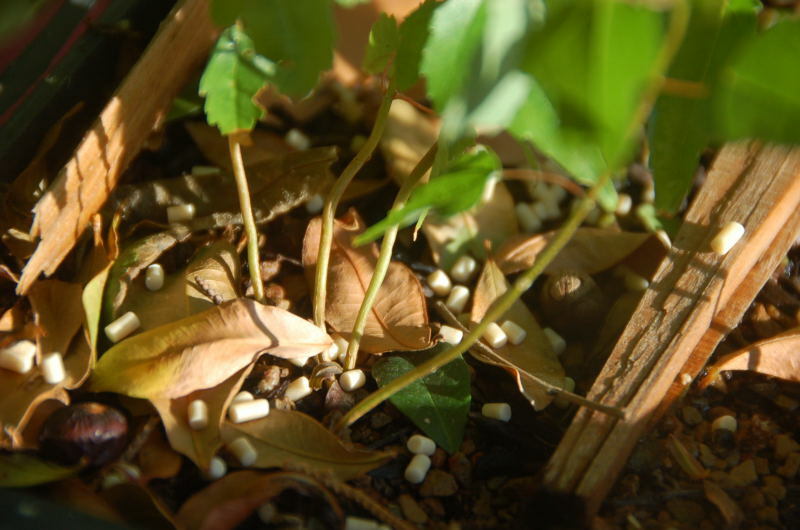 The seeds are about an inch or so tall and now is the time to stop their verticle tendancies. I do this with a piece of window screen. This screen is round because I use it in my sifter for getting out the last bit of dust when I make topping for in between moss when dressing a pot for an exhibit. 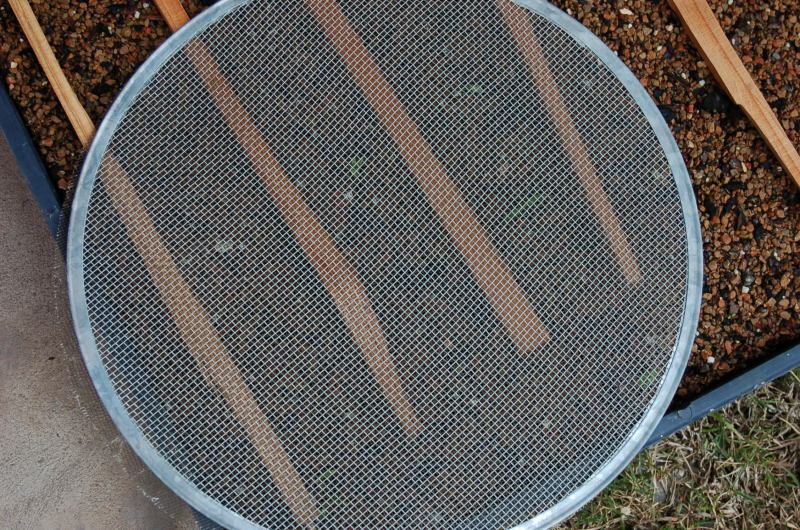 On top of that, I just use one of the screens from the sifter to help weight it down. 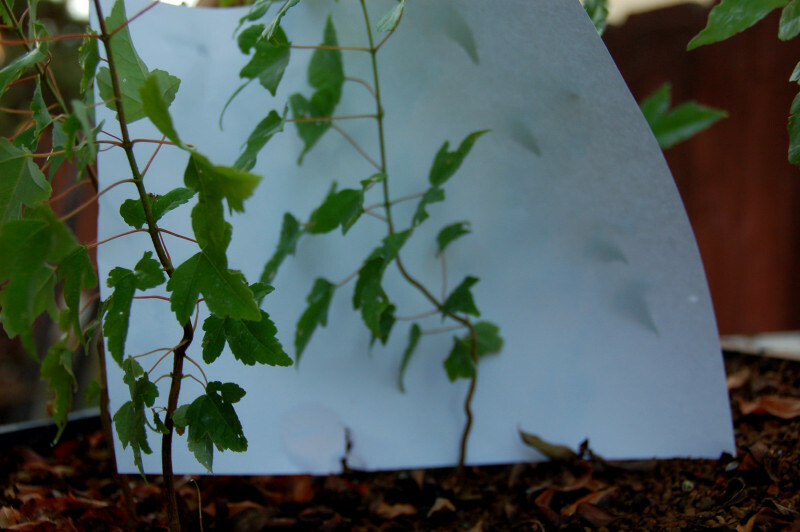 The seedlings are small but pack considerable punch and are able to just lift the window screen if it is not weighted down. In a couple weeks I will be able to show you what this does. It is amazing and really a miracle of nature. EDIT: About five more popped up today. 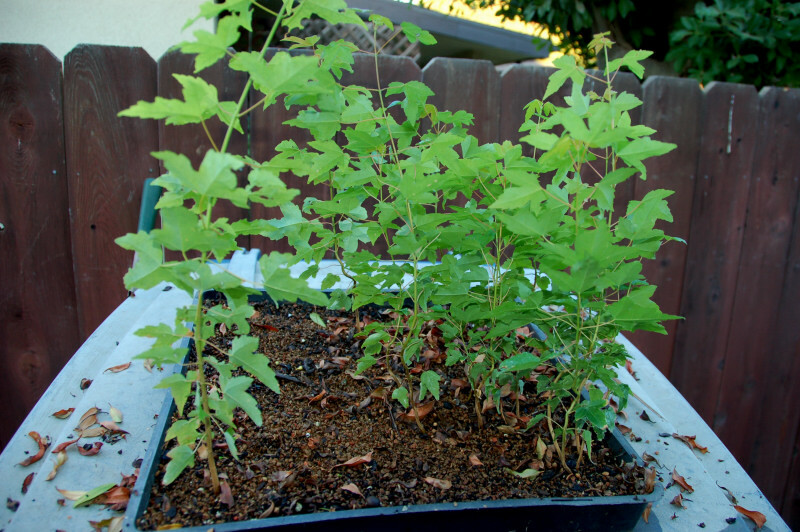 By the end of the week I should have rows of maples. I planted some of the seeds in clumps. I can see a couple coming up where there is two in the soil. Tomorrow may have a better picture to show. 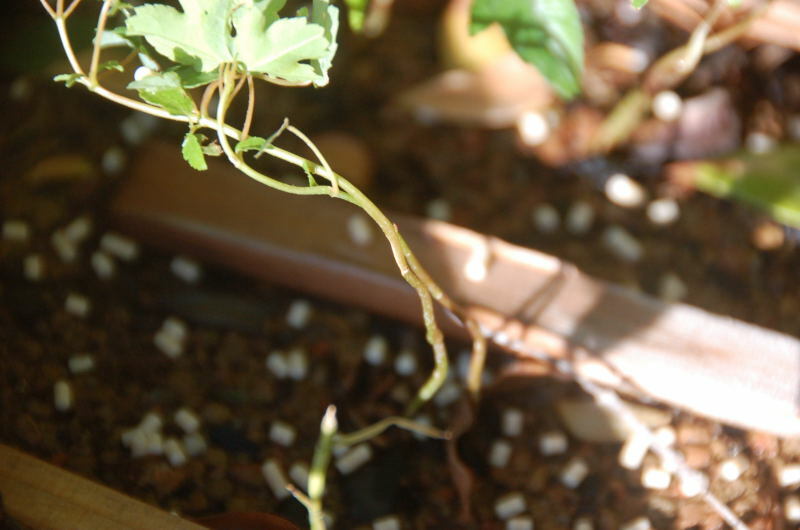 The plant in the first photo is about 1 inch tall today.